This page came about following a suggestion from Suki d'Angremond, e-mailing from Lake Jackson, Texas, USA. : "I was born in the village in 1968. What about a message board for old and new inhabitants?" So, treat this page as a kind of chat group. Let us know where you are, what you're doing, what you remember of your time in Wrington, and so on. Just e-mail copy to web@wrington.info Suki's full message, and others sparked off by her are placed in reverse date order, so the most recent is always at the top. There's also the Visitors' Book page. There are pages of photographs from Rosemary Hodges, sparked off by Peta Meadows (Mellett) contribution, and now one from Tony and a 1930s mug owned by Lawrence Croucher showing the Paradise. It's the website's normal policy not to publish e-mail addresses of correspondents for security reasons. If you wish to make contact, e-mail the website, and it will be passed on. 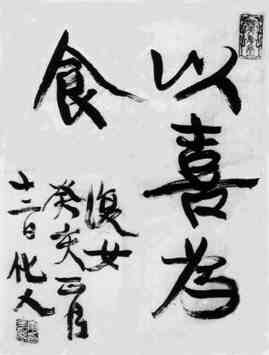 "This calligraphy from the 1920's is by Xiaopan's great grand father. It means " have a banquet of joy". We wish you a hearty helping for the new millennium." "I'm currently working on a research vessel off the coast of Louisiana, USA, we are currently down for weather as we have an extreme northern front blowing through ( 3-4 metre seas on xmas day!). As I had all this free time I decided to look through the web site to show my American friends where I live and what goes on in a small English village. It was great to see snow in Wrington as it means it must be cold and horrible there too!! Can't wait to return to the village life end of January for some decent beer down the Golden Lion!! Regards." "The web gets better everytime I look at it. It has been particularly of interest over the past few months. I have seen photos of my dad's garden, photos of them at the exhibition which was most interesting... hope we will see more of the exhibits in the near future. Now this time Aunti Sylv has put in a beautiful selection of old photos, one including my grandfather. I am thrilled to hear from mum ( cyber gran to her grandchildren) that she will soon be learning from you, how to use the internet. Thank you so much for bringing home a little closer and reminding me what a great place it was to grow up. Please continue with this great work." Many thanks for your quick response to my E-mail and .. thanks also for talking to Mr Wedlake about my ancestors. My brother and I tried to find Beam Mill during our visit and we saw a property near its vicinity but didn't know whether this was the original. I'd be interested to learn whether the original building still stands. I have a very informative letter from Cmdr Michael Lawder of .. Wrington dated 24/05/1995 which provided enough information for me to compile quite a comprehensive family tree. According to the details in the letter John H Organ who was the village printer had a grandfather called Walter George who was a brother to my great grandfather Frank. Frank, Walter George and Albert were grandsons of the Reuben to whom I was referring (very confusing I know). I will certainly be paying regular visits to the Wrington Web Site." My Great, Great, Great Grandfather Reuben Organ lived in the village and is buried in the church. I believe that he and his family lived at Beam Mill. I visited the village last June with my brother for the first time and found it extremely interesting to visit the place where my ancestors lived over 200 years ago. I learned that someone who must have been a distant relation of mine, also related to Reuben lived in the village until his death a few years ago." Greetings to all at Wrington. Ruth & I are having a great time on holiday in sunny Sydney with my old army pal and family whom I met in 1952 when her Majesty needed us to do National Service. They have since emigrated to Australia. Today we were taken to an old Australian village - Berrima - which was very quaint with wooden, painted houses. It also boasted a very nice museum. We have also spent a couple of days in Sydney which was very enjoyable with so many diverse things to see and do. We were in Cambletown last Saturday where they were celebrating "Fishers Ghost Festival" where a man was murdered and his ghost is reputed to have shown the location of his shallow grave and therefore the identity of his killer. There was a big parade led by some of the athletes and volunteers who took part in the Olympics. I guess I must be one of the very few to hold and admire both the Olympic and the Paralympic torches, they are superb. I was thrilled to bits. Unfortunately none of us had a camera to record it. Yesterday we went to the Blue Mountains, gorgeous scenery and we went down the gorge on the scenic railway - the steepest railway in the world. There were also loads of parrots flying around. There is also a very large Turpentine tree. I could go on but it'll wait till we are back in Wrington early in December. Just a note to say how much I enjoyed the photo's of Sylvia Millard in the new feature of Historical material. Now I hope you won't mind if I make a couple of suggestions. First could you add to the new photo's taken from the church the direction in which they point as I have trouble orientating myself. ie. NE, SE, West, Etc.. This would help no end as I am not familiar with all the places you name. Also if you intend to have Historical material in the new feature as well as historical photo's you might consider the following two web pages which I found recently. PS I thought the December Photo's of sunrises was terrific. First of all thank you and your fellow villagers very much for all your help in making our short visit an enjoyable success. It was a memorable way to introduce my wife Jane to England. Finding a living relative was a huge surprise. Glad Brough's uncle was my grandfather. Although they never met, she knew of him as a member of the family who sent food packages during the war. She also let me copy some of his letters dating from 1928 up to 1945, which I was able to present to my mother on her 80th birthday. The identity of John's father remains a mystery. His cousin Frank (son of Jane Chidzey and the mystery man) lived at Redhill and owned property in Wrington. He was known as doc Chidzey and died in the mid-1930s. This may be a more fruitful avenue to pursue. I will try to get more information from my aunts when I visit Australia in January. In the meantime we give you this picture of us in a festive mood on the Yarra Yarra River in Melbourne and wish you a merry Christmas and a happy new year. We shall return. I am a descendant of John Edward Chidzey, son of Mary Chidzey, later Mary Cole. John left Wrington in 1912 and settled in Melbourne Australia where he remained until his death in 1956. I shall be visiting Wrington on the weekend of November 18. I would like to make contact with relatives -- Chidzeys or Coles -- and people knowledgable about village history. I only discovered this excellent website last night. Please pass this query with my email address.to interested parties. Thanking you in advance, I look forward to visiting. "Greetings to all at Wrington. Ruth & I are having a great time on holiday in sunny Sydney with my old army pal and family whom I met in 1952 when her Majesty needed us to do National Service. They have since emigrated to Australia. Ruth & Roy Robson" . Rosemary Hodges sent me a couple of back issues of the Village Journal and I decided to look up the webpage. I was delighted to see several photos that I well remembered from my two-year stay in the village, about thirty years ago, when I taught in the school. The second year I had the first portable classroom, which was set up in the playground and, we were assured, was only temporary. I enjoyed seeing several familiar names in the Village Journal and send my best wishes to everyone who was in the village during my stay. "Hello Trevor, well after some 65 years or so we meet again. I was thrilled to get your letter [e-mail] via Richard this morning and I must say your memory is fantastic. Puts mine to shame. As I told Richard it must be the Somerset air that has something to do with it. I certainly remember Hughie Martin at the garage. Whenever a car came into Paradise that needed major problems fixed they were always referred to his place. I think the main thing I remember about him was that he had one hand that he always kept covered with a big leather glove (due to some major injury) and like any eight or nine year old I wanted to see what it looked like without the glove on, but I never did get to see it. The one shopkeeper I remember is Mr.Farley at Farley's store probably because he sold sweets and also had a stock of Meccano and toy trains. with beautiful hair but she certainly left quite an impression with you. I think you must have been at Wrington School longer than me, into your early teens maybe, when you would have been more susceptible to her charms!!! I was most interested to read that Dr Bell had an article written about him in The Field. I have found the magazine on the Web and my next job is to write to them and see if I can get a copy of the article He was most kind to me when my Father was away in the war probably because I was a bit of a fishing nut. I think Mr. Carter, the Redhill policeman who you mentioned also had a daughter who would have been five or six years older than me. I remember her, so maybe I can be excused for not remembering Miss Pow!!! So, after some 65 years I'm at last catching up on the Wrington news. Pity we could not get together and hoist one at the "Golden Lion" (is George Puddy still around?) as I'm sure that you would have more anecdotes to give my memory a jog." could drive, and he rode us round the field. were "you are fooling around, old son." above the Paradise. He used to drive the children from Redhill to Wrington to school. Does he remember any of the shop-keepers - Mr Farley, Mr Amor, Mr Cook, Mr Lawrence, Mr King ? Dr Bell is still spoken of a lot. We all have our favourite anecdotes ! When he died in 1974 he had an article devoted to him printed in The Field. He seems to have been a nationally known fisherman. Also a very keen shot and gardener. Perhaps Tony remembers Mr L.W. Bisgrove, the headmaster, or Mr A.C. Turner, teacher in those days or Miss Pow, a lady teacher ? I think she and Mr Turner married. She was an attractive young woman with beautiful hair, and some of the precocious among us used to fantasise about her a bit. the back, was Pow of Bridgwater, and that it reminded me of our 1930s teacher, who also had that name, and that I thought she originated from the Bridgwater area. the walk, one foot turning in slightly. I stood and watched them walk out of sight. I wanted very much to speak but felt she would have no fond remembrance of me. I still have a school report with her name attached. I hope she is well. The Redhill policeman was a Mr Carter. He had one son, Phil, who was 2 or 3 years senior to us. Paradise was demolished years ago, but now plans are being considered to develop the site into a 115 bed hotel." "The village postman (Mr Walter Ferris) was my maternal grandfather and his daughter, Doris, was my mother's sister. I believe she worked at the Paradise on leaving school. Lynn Leonard } - Cheshire. Pam Raven (née Board) remembers Tony Loach." "What a pleasure it was finding your new Web Site this morning , as I spent part of my childhood in Wrington and it brought back a lot of old memories. I arrived in Wrington in 1933 when my Father built the Paradise Roadhouse, (later called Paradise Motel) on the A38 at the bottom of Redhill. He got the name Paradise from the very small area there called Paradise and the farm nearby called Paradise farm. I have fond memories of those times, the walk to Wrington School across the fields, and later when I got my first two wheel bike the ride along the lane. The ride home was always broken by a stop to look in the door of the blacksmith's shop to watch him shoeing horses. Unfortunately the war years came and my Father (Ron) went off to do his bit and left my Mother (Molly) to run Paradise. She managed to keep it going to about 1943 but no money was coming in so she had to sell. It was not that Paradise was not busy at times, as I well remember the bus loads of people that would arrive there in the evenings to get away from the night bombing of Bristol. They would sleep on the dance floor (at no cost) but spent very little money and would leave again in the morning to go back to work. The petrol side of the business was also nonexistent of course because of the rationing. Other memories crowd in, but the one person I remember best is Doctor Bell. He was the village doctor for many years and saw me though the usual childhood problems. He also taught me how to fly fish at Blagdon Lake (there is spot there called Bells Bush which I presume is named after him), as he said I was too old to be still fishing with the worm. He was dedicated to the well being of the people of Wrington. In the mid thirties there was an outbreak of diphtheria in the village and children started to die. He undertook an inoculation programme for all the village children the cost of which he bore out of his own pocket (No Health Scheme in those days). You only paid if you were able to, although some of the better off members of the community helped him out. He also came to your home to visit you if you were sick; maybe they still do in Wrington but they sure don't here in Canada. I did manage to see him again in about 1970 when I visited from Canada (I emigrated in 1948) but he had lost his memory and did not remember me. Wrington lost a great man when he died. had landed in France after crossing the Bristol Channel which he mistook for the English Channel. Some navigation that!! This caused great excitement in the village and lots of laughter. A couple of other names come to mind , the village postman a Mr. Ferris and his daughter Doris who was my babysitter at times. Also my chum Percy Parsley, and the village policeman who had a house just at the bottom of Redhill and used to make his rounds on a bicycle. Neale wrote about the old road (now A38) out from Bristol. One of her sketches shows a cross section of the road right opposite Paradise Motel in an area where I used to play. Well play isn't exactly the word I should use, maybe "get into trouble" would be better. I attach a picture of the Paradise Roadhouse in its hay day, taken in about 1938. All the best to Wringtonians." I did find the post from Yvonne Spratt very interesting. She is the same age as me and I can remember her and her family. Yvonne obviously has a very good memory and the names of the people bring back many happy memories, I can still remember climbing over the wall into the haunted house. My father worked for P J Hare Ltd untill he retired 14 years or so ago and he and my mother left Wrington and now live in Thurlestone. He used to sit in the ground floor office on the corner of the High Street. He would be remembered as he had polio and walked with callipers and crutches although it did not restrict his activity to any great extent. I have two brothers Ian And Martin. Martin works in Japan and visited this week for the 1st time in over a year. We had a family dinner in Weston at Duets which I believe was converted from a Post Office to a Restaurant a few years ago by another ex Wringtonian Timmy Collins. John Clements who is the only old freind I have kept in touch with over the past 20 years and is well known in the Village joined us and his girlfriend gave me this web page. The names on the old photographs were fascinating and I will send a couple I have which I hope people will find interesting. From when I was born in 1954 I lived in Wrington until the time I left in 1972 to come to New Zealand. I married Robert Spratt who is the Grandson of Mrs Pearce who used to live out West Hay, first house on the left after the haunted house at the bottom of chapel hill!!! I went to Wrington School and looking at Mrs Hodges pictures I can remember most of the people mentioned. I see I even have my picture on there!!! Mrs Hodges taught me and also taught 3 of our sons when we came back to Wrington in 1979. After Wrington School I went to Churchill School and remember the 'excitement of the day' when Terry Lyons couldn't get the bus down from Blagdon because of snow or ice so we got to spend the day at home!!! My sister Marilyn, lives in Nailsea and is married to Alan Garrett whose parents still live in Wrington. My father, Leslie Chard, was born in Wrington in 1923 and spent all his years there until he and my mother, Ruth, left to join us in New Zealand three years ago. We all enjoyed reading the book 'Wrington Recalled' and it has sparked many memories, so much so that Dad has started to write his memories about Wrington and his years of working at Sullivans the bakery, Amors with Mr Amor and then Mr Gallop, also at the Post Office with Mr Sydney and then Alan and Lesley Birch. We look forward to joining you all in Wrington again soon. I was born in the Bristol Royal Infirmary in 1975 and, apart from my first couple of years across the valley in Churchill, lived in Wrington pretty much for the rest of my life...until now that is! Since last year, I've been living in South Africa, with my South African husband, Peter. Many of you might have caught a glimpse of the handsome chappie, all dressed up in his morning suit, outside All Saints', on 29th May last year...the day we tied the knot! If you didn't, I could always post the piccies on the "schmoose" noticeboard! During a recent telephone conversation with me, my father, Bill Lord, Sr., informed me that Wrington is now on the Web so, of course, I hastened to pay you a virtual visit. Let me say at the outset how impressed I am with the Wrington Home Page, its lay-out and its content. Over the past week, I've been showing Wrington off to all my friends and staff here at Dalhousie University ... you may live to regret this as the number of visitors soars next year and accommodations at the local hostelries become strained beyond capacity! I was fascinated, also, to be able to look down from the church tower and pick out my parents' home on Brooklyn; I think I could even see the tail end of their car on the driveway! We came home for a short visit in January 2000 and stayed with a neighbour. On our first night home we had a curry with some of our neighbours and on the second night we had another get together at the White Hart. We now look forward to our next visit in July when we hope to organise a Garstons Close street party. In the meantime this website keeps us right up to date with all that is going on in Wrington and helps with the homesickness! I have really enjoyed looking around Wrington and am becoming a bore telling everyone here about the website. The city of Sao Paulo is as far removed from Wrington as is possible. My two daughters Florence aged 6 and Elizabeth 3 want to say hello to all their good friends at Wrington School and Wrington Pre-school. When we come back for our visit in July they will call in on both and exchange hugs and kisses just like they did in January!!! I run avery successful fundraiser that benefits my son's school and the local businesses in Lake Jackson. It seems to me that a similar venture would work very well in Wrington and it is very easy to set up. The scheme does require a small amount of capital to get it going but that is recouped very quickly. In the last 18 months I have raised $15000.00 for Jack's school and a lot of businesses have seen an increase in trade that otherwise would have gone outside of Lake Jackson. It does take a bit of work to set it up and keep it going but I'm $10,000.00 away from a new (slightly used) school bus for the school so I don't mind giving my free time to keep it going. If any fundraising organization would like details please contact me via the schmoose page and I will gladly forward the mechanics of the scheme and answer any questions they might have. I didn't know who to address this idea to so that's why I posted it to the schmoose page! Just to let you know I am now running my own head-hunting firm in Romania, am married to a Romanian and having a great time. What about you? I remember Suki - we lived next door for a while and we met at the Plough a while back. Hi to you Suki. My name is Pete Davey and anyone who wants to contact me can - Nick Whittam, Stu Milne (Bobby) - you out there? Having found the website and in particular Suki's message I just had to say Hi. Suki sang at my wedding in the URC church in1978, over 21 years ago ! With mum and dad still living in the same house I do visit regularly and keep up to date a bit but I love the idea of this page. I've been here in Weymouth since I left the village to go to college. I'm now teaching infants in nearby Wyke Regis, following in the footsteps of the fondly remembered Mrs. Hodges. I hope some of my pupils will remember me as long and as fondly. I also remember Mr. Waite who Mr. Dyke took over from. Mrs Green had the middle class and a Mrs Faith took over from her I think. I remember the huge whole school pictures we used to do in the triangle at the top of the hall- no longer there since the ceiling was lowered. I remember sitting next to Jonathan Hibberd doing times tables and partnering a not very keen Peter Elswood for country dancing. Rosalind Nipper finished her sewing before me, I was so miffed, I wanted to be first ! As for Allayne Brown's beautiful long plaits, well I'm jealous of those still. "My Dad gave me the web site for Wrington and I was delighted to find news about the choral society. It is really nice to be able to see what you are all going to be performing this year and hopefully I will be visiting at a time when you have a concert scheduled. Our Christmas carol concert was an overwhelming success, we sang the Halelujah Choras, Carol of the bells (wilhousky arrangement), Do you hear what I hear, Monotone Angel, and a brand new piece written by Robert H Young entitled, "A babe is born" which was the highlight of the show (According to the press!) My brother has a copy of the sheet music. in the world that my husband's job takes us. My choir is planning a trip to europe in 2002 and at the moment we are busy fund raising. Maybe I can persuade our choral director that a visit to wrington would be highly beneficial, both musically and culturally as many of the kids in our choir have never left Texas.